Conor McCloskey netted Ballymena's second goal as they came back to claim all three points against Carrick. 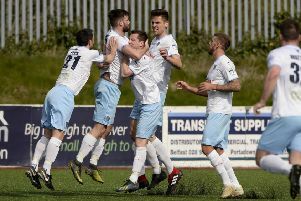 BALLYMENA United moved into sixth place in the Danske Bank Premiership table after coming from behind to defeat relegation threatened, Carrick Rangers at Warden Street. Despite their early dominance, the Sky Blues found themselves behind at the half-time interval to Eamon McAllister's 44th minute strike. However, two goals inside two second half minutes from Kyle Owens and Conor McCloskey turned the game on its head. Second half substitute, Matthew Shevlin then made certain of the points and back-to-back league wins for the Braidemen when he turned the ball into the net from close range with four minutes left on the clock. The Sky Blues were clearly up for this one and they came so close to breaking the deadlock with just 57 seconds on the clock as McMurray curled his shot from 12 yards off the foot of the post with Carrick keeper, Harry Doherty beaten. And moments later Joseph McKinney's close range header was cleared off the line by Andrew Mooney following a short corner kick. The Carrick keeper had to make himself big to clock Cathair Friel's shot when the striker was played in behind the defence by a superb pass over the top by Tony Kane on 12 minutes as Ballymena turned up the heat at the bitterly cold Warden Street venue. Carrick's first real chance came on 26 minutes when Ben Roy found Andrew Mooney, who got behind the Sky Blues' defence, but the striker was denied by Ross Glendinning who got a crucial hand to his attempted lob. The visitors had finally settled into the match and from a corner kick, Patrick McNally's header was cleared off the line by Francis McCaffrey before Glendinning reacted well to save Mooney's follow-up strike from eight yards. Ballymena had a glorious chance to take the lead three minutes before the interval as Kane floated the ball towards the back post and Kyle Owens' header was saved well by the outstretched hand of Doherty. Straight up the other end Michael Smyth found Roy on the edge of the penalty box and his shot was parried into the path of the unmarked McAllister who made no mistake with the finish to give Carrick the lead going in at the break. Glendinning had to be alert to deny Carrick a second goal six minutes after the restart as Michael Smyth found Mooney in space just inside the penalty area but he was denied by the Ballymena keeper. Friel rifled a powerful strike narrowly over the crossbar from 25 yards on the hour mark as United desperately attempted to get back in the match. And the United striker sent a gilt-edged chance begging on 70 minutes when he side-footed wide of the post. Owens was then denied by an outstanding reaction save by Doherty who somehow got across his goalmouth to parry teh defender's header behind. And from the resultant corner the Carrick keeper could do nothing to stop Owens' glancing header into the corner of the net from Kane's delivery as United were back on terms. Two minutes later and the Sky Blues had completed the turnaround as McCloskey hooked the ball over the head of Doherty from all of 30 yards. Carrick's heads dropped and Ballymena sealed with four minutes to go when Shevlin turned in Gary Thompson's shot at the back post. The result moves United into the top six above Glentoran but Carrick remain second from bottom. Ballymena United: R. Glendinning; J. Ervin, K. Balmer, K. Owens, S. McCullough; C. McCloskey, A. Kane, J. McKinney (G. Thompson 57), F. McCaffrey (Shevlin 57)); J. McMurray, C. Friel; Subs Not Used - C. Brennan, S. McAlorum, K. Braniff. Carrick Rangers: H. Doherty; L. Chapman, D. Larmour, P. McNally, M. Edgar; E. McAllister, G. Taggart (M. Maybin 78), L. Hassin, B. Roy; A. Mooney (M. Surgenor 69), M. Smyth (C. Morrow 84); Subs Not Used - D. Gage, M. Clarke.